It’s time to explore beyond Tokyo’s concrete jungle to its neighboring cities and destinations. One of the most popular Tokyo day trips is Hakone, located 100 kilometres from the Japanese capital. With three kids in tow including a twin set of toddlers, Daniel and I were looking forward to seeing more of the countryside without traveling far. Hakone or Hakone National Park is famous for Lake Ashii, located at the foot of Mt. 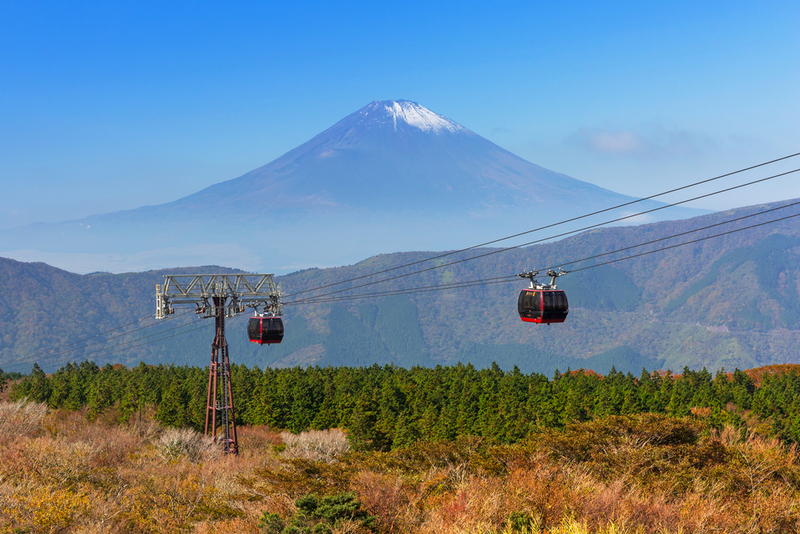 Fuji (“Ashii” means, “foot” in Japanese), known for its stunning landscape and a great view of Japan’s famous peak. 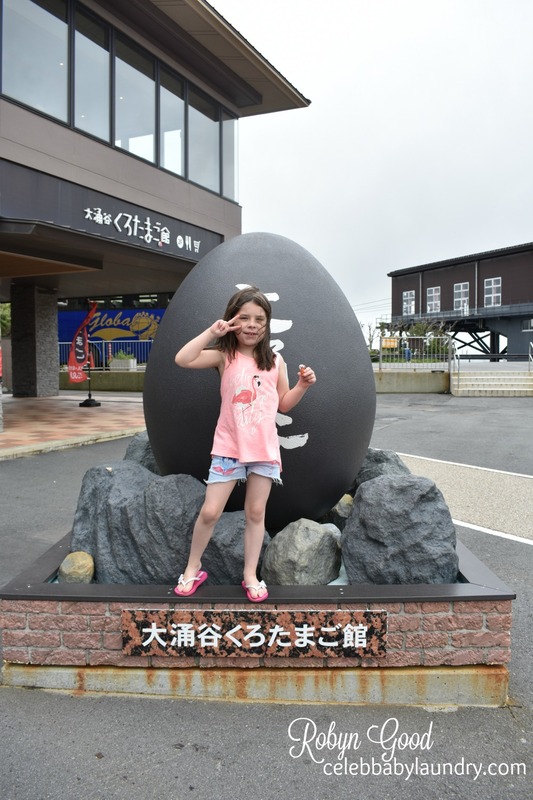 A family-friendly destination, one of the popular things to see and do in Hakone is the famous Hakone black egg. 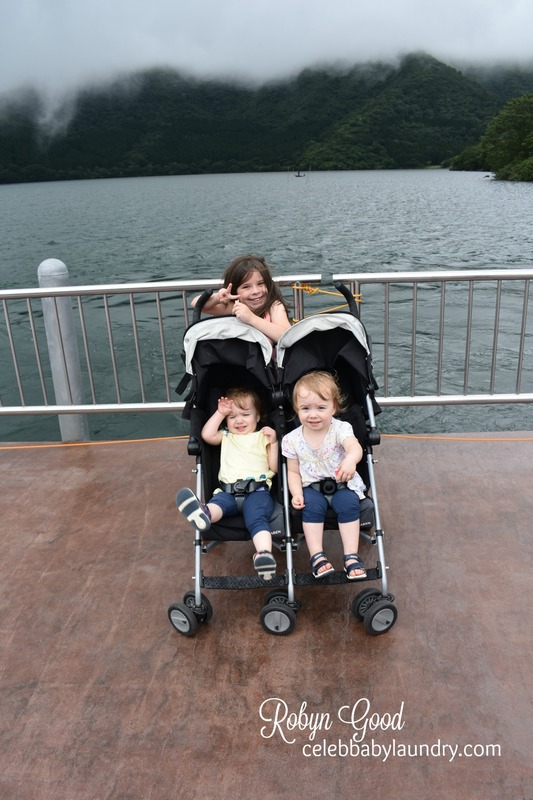 I know Ava will love it as much as we do, so off to Hakone we went. We reached Owakudani Station and in an instant, you can smell sulphur. We exited the station, Ava blurted, “It smells!” as soon as she sniffed the rotten egg smell from the sulphur. Well, many of the kids were also covering or pinching their noses so I did not feel too bad. By the way, there are plenty of tour buses that can take you to this part of Hakone from Tokyo. 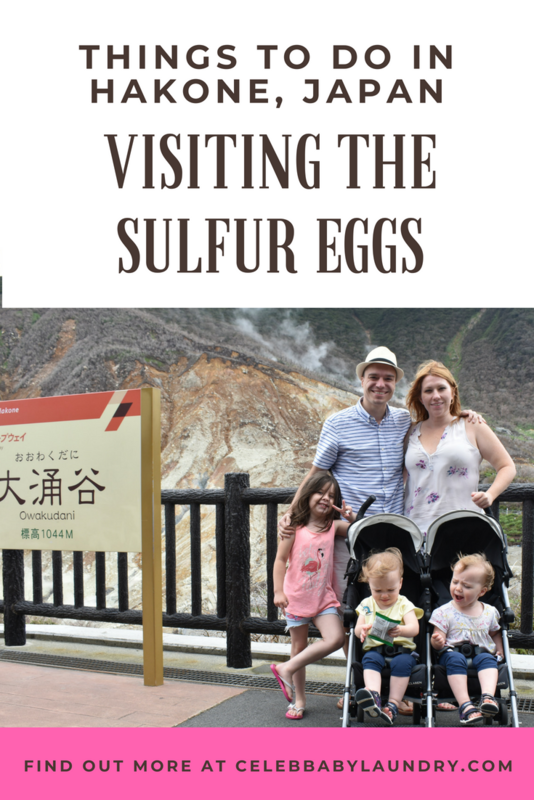 With the rotten egg smell, we were surrounded with volcanic steam backed by Hakone’s lush mountains. I can imagine how beautiful it would be during fall with all the foliage and trees. Hakone is quite big with plenty of attractions and the famous black eggs are located at Owakudani also known as the “ Great Black Valley”, sometimes called as “The Great Hell”. We learned that Owakudani is a crater of Mt. Kamiyama, Hakone’s highest peak. To reach this volcanic valley, you have to take the popular Hakone ropeway. I have to admit, the cable ride triggered by fear of heights, but Ava and the babies love the views especially the boiling site below and Mt. Fuji, that I calmed down in an instant. We felt so close to Mt. Fuji during that cable ride. We also learned that sometimes, the ropeway is closed and I felt lucky that my family could experience this in Hakone. Kuro Tamago or Black eggs are just your typical boiled eggs. The inside remains the same – white and yolk. Its distinct black color is only shell deep, brought by how they were boiled in hellish water with high iron and sulphur content. If you want to see how they were boiled, you have to walk uphill and see the boiling site. Even with three kids, we went to the boiling site, because it is the highlight of our trip. 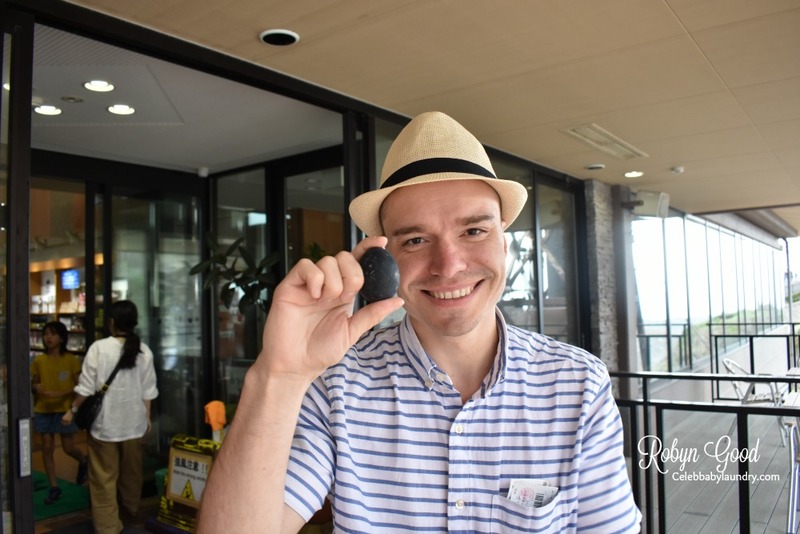 Seeing how it became black gives more weight on the popularity of Kuro Tamago among tourists. For those who checked out the boiling site, you will witness how chicken eggs are placed in steel pen then submerged for 60 minutes in a 80°C natural spring water. Then it is transferred to an enclosed steel box to steam for 15 minutes. Visitors love to see how workers pull out the steel pens with black eggs inside. Going back to the main area, we didn’t miss to strike a pose at the giant black egg and pointing to the volcanic steam. I think the girls loved this adventure. We went to gift shop and bought a pack of 5 black eggs. It is said that each of the black egg can add 7 years of your life. I think this is one of the reasons why I saw a lot of Japanese grandmas and grandpas at Owakudani. A pack of 5 kuro tamago costs 500 yen. Daniel and I shared the pack adding at least 14 year of our beautiful life. Ava and the twins shared the one egg. Protein rich snack, eh? We also spent ample time inside the gift shop, checking out trinkets that are black egg related. What caught Ava’s eyes are the black egg-inspired Hello Kitty. There’s Hello Kitty in a Black Egg (looks like stuffed inside the egg) and Hello Kitty posing next to the black egg. Ava loved it. Within the station, we looked for a spot to have a good family shot as well as souvenir shots of the girls with the mountain and volcanic steam. It’s summer now in Japan and the mountain air gave respite from all the humidity. Hakone will always be one of the best day trip destinations when in Tokyo. I like how close it is from Tokyo and the black eggs of Hakone is perhaps on of the most intriguing attraction you should check out. Mere curiosity? Maybe. But Owakudani reminded me of the volcanic nature of Japan and how an impending destruction can be beautiful as well. 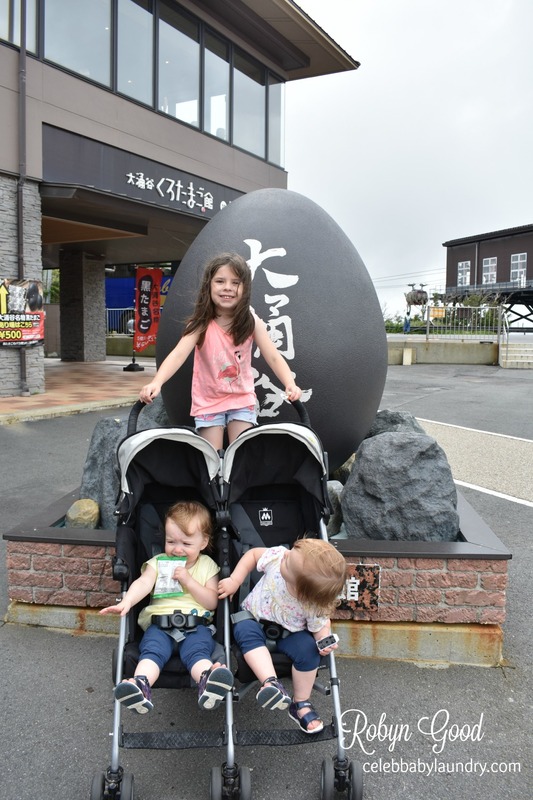 Have you visited Hakone’s black eggs? Make sure to include this in your next family adventure in Hakone!